Previously: Mystery Fun House, Orlando, Florida. 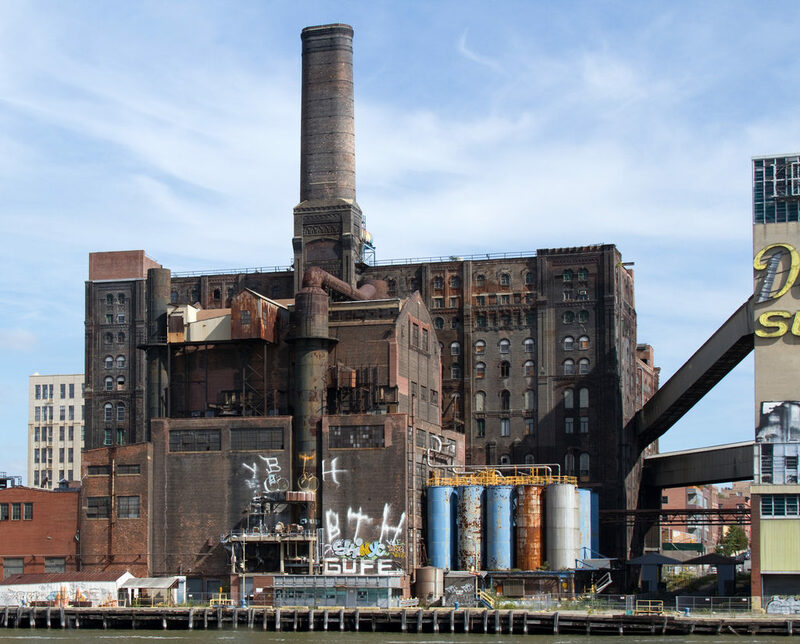 Once upon a time, if you wandered over to the Williamsburg waterfront in Brooklyn, New York, you’d see an awesome sight: The hulking remains of the Domino Sugar Factory, which at one point was the largest sugar refinery in the world. It’s not there anymore; the refinery was demolished in 2014, replaced with a public park, mixed use space, and an affordable housing complex. 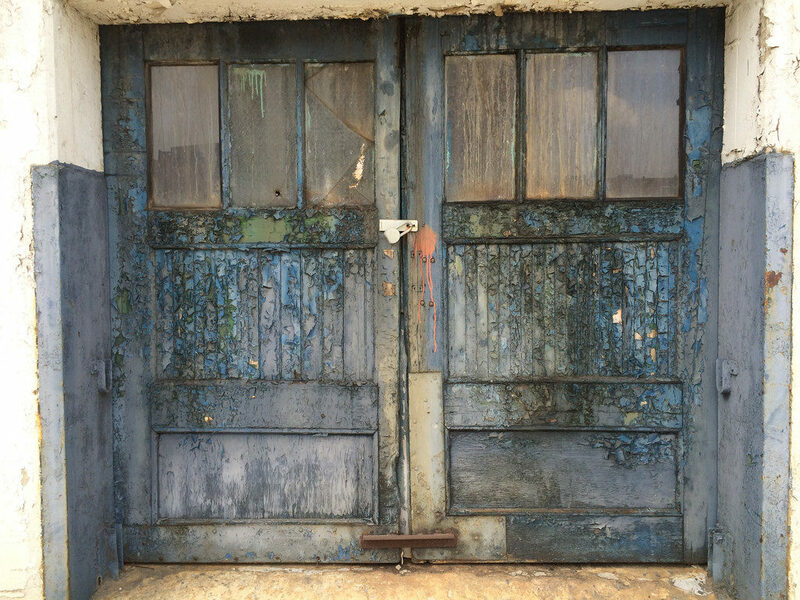 But during the 10 years the factory sat abandoned, it was immortalized time and time again in photography and video — and now, those photographs and short films are all we have to remind us of what the area once looked like. 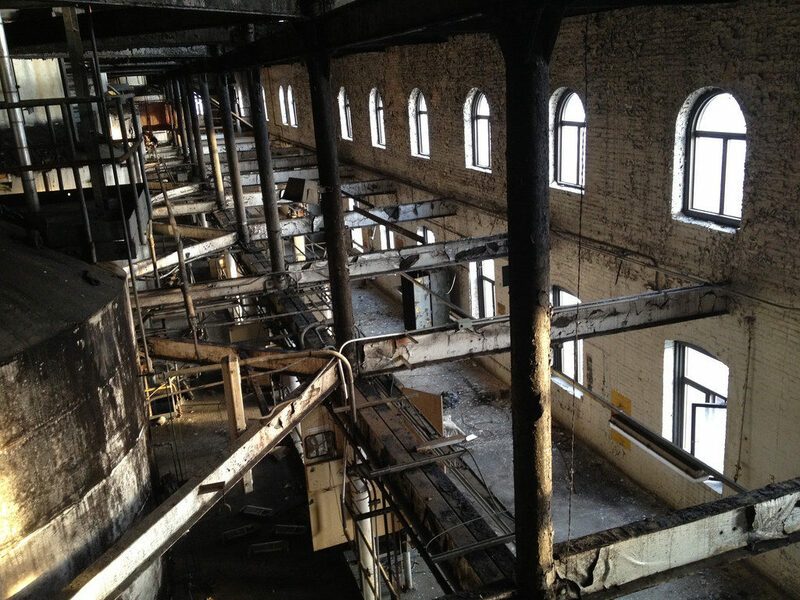 Interestingly, though, the refinery that grew to be a Brooklyn icon wasn’t the first refinery built on those grounds. 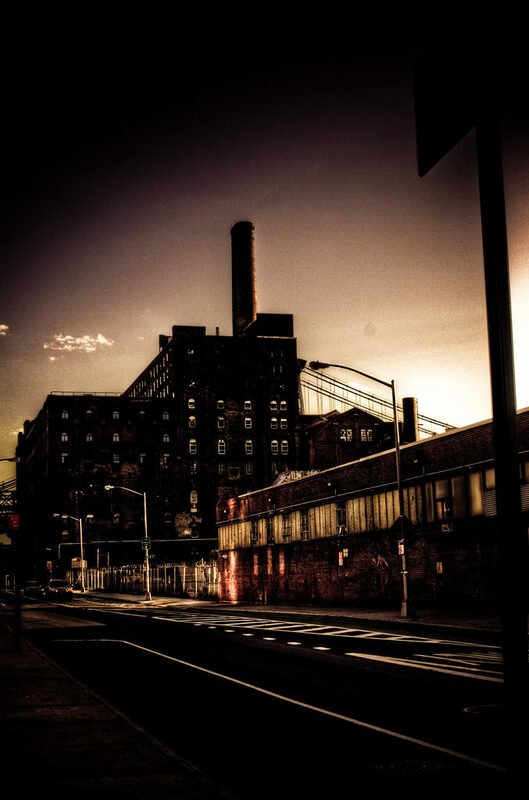 The original factory, owned by the wealthy Havemeyer family, went up at the intersection of Kent Avenue and South 3rd Street in 1856 as an extension of the business the Havemeyers had begun some 50 years earlier when they built their first refinery on Vandam Street in Manhattan. 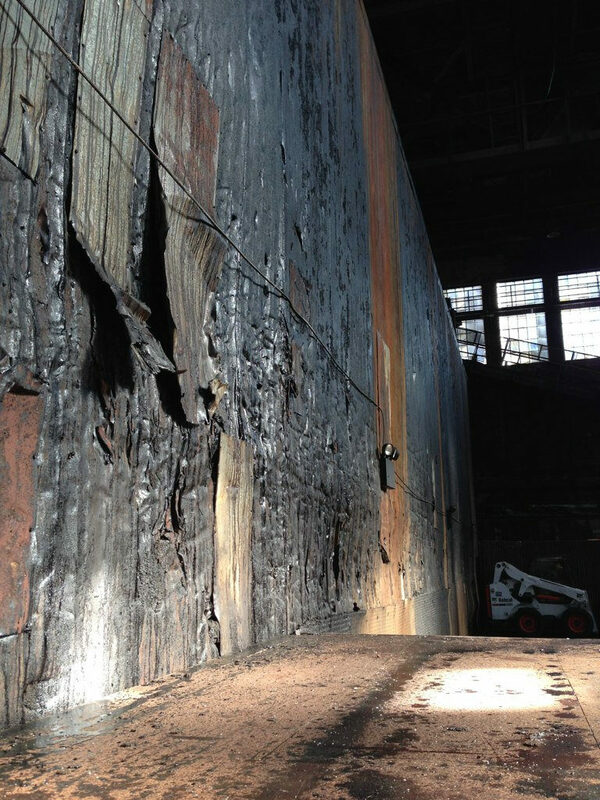 However, a terrible fire destroyed this original facility in 1882. It was rebuilt, though — this time in brick and stone — with the new refinery standing 10 stories high, while its filter house stood 13. 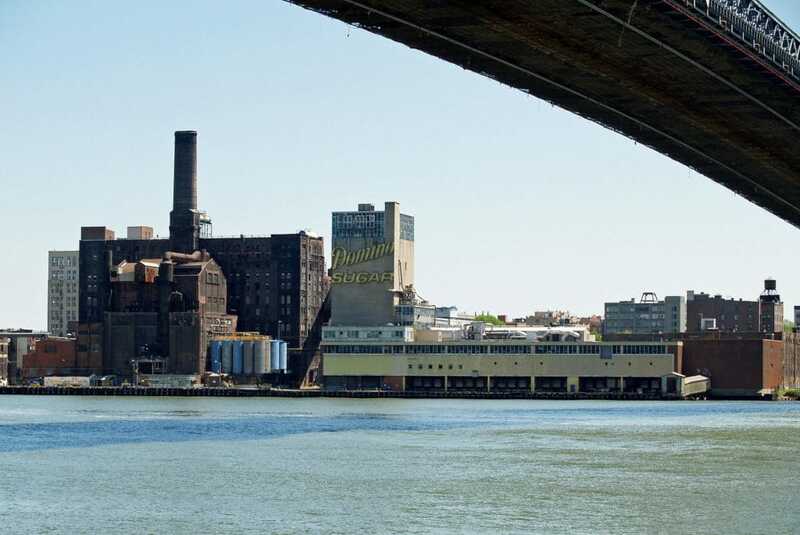 (The smokestack wasn’t added until 1936, but it, too, has become iconic; the same goes for the “Domino Sugar” sign, which arrived in the 1950s.) 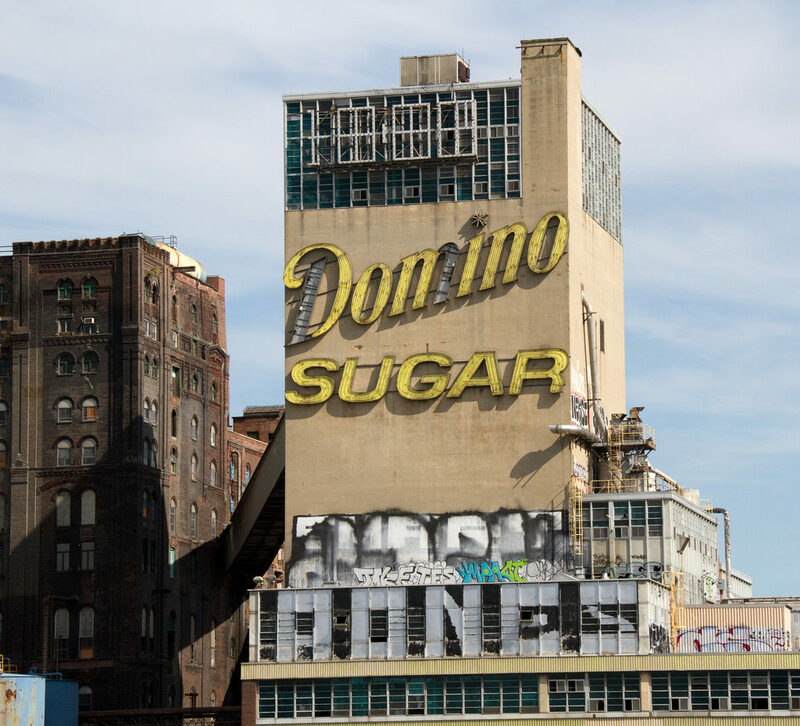 The company prospered, going public as the American Sugar Refining Company in 1891 — one of 12 original companies in the Dow Jones Industrial Average — and being renamed with the now-familiar Domino moniker in 1901. 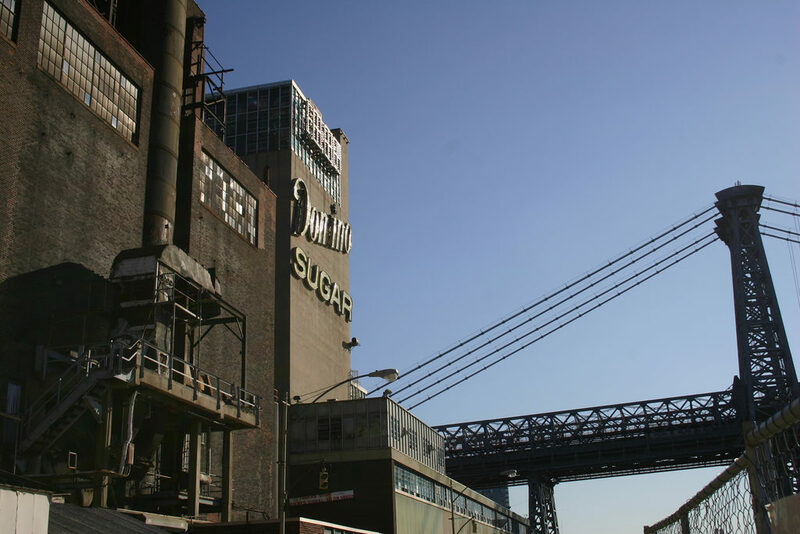 By 1870, the Brooklyn factory refined more than half of all sugar used in the United States; by the 1920s, the facility employed 4,500 workers and could refine four million pounds of sugar every day. 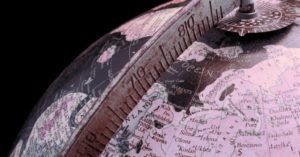 But the prosperity came at a cost, of course — a human one: Sugar cane was produced cheaply in the Caribbean with the use of slave labor; workers in the plant itself were exploited, with strike after strike for better pay and working conditions continually struck down (the workers weren’t able to unionize until after the First World War); and a monopoly known as the Sugar Trust established by the American Sugar Refining Company set a damaging precedent for small businesses in the United State for years to come. 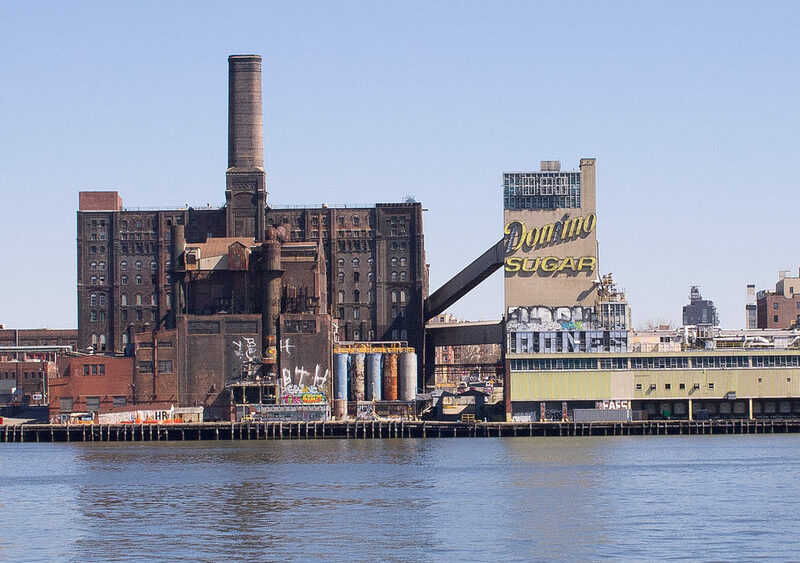 Still, though: The Domino Sugar Factory was an essential employer for the area and largely responsible for the development of Williamsburg over the years, decades, and centuries. 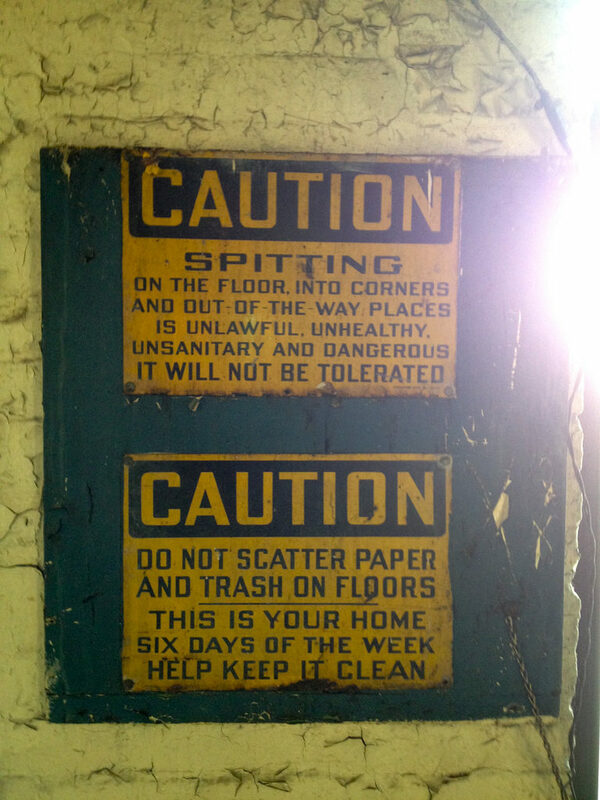 But in the latter half of the 20th century, time caught up with the factory. 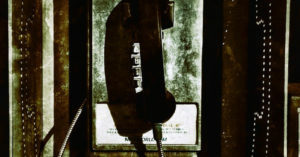 Production fell, as did the number of employees; the demand for sugar lessened, replaced with cheaper alternatives like corn syrup; and finally, with working conditions worsening yet again under new management, the refinery was the catalyst for the longest strike in the history of New York City — one which ran for more than 600 days between 1999 and 2001. 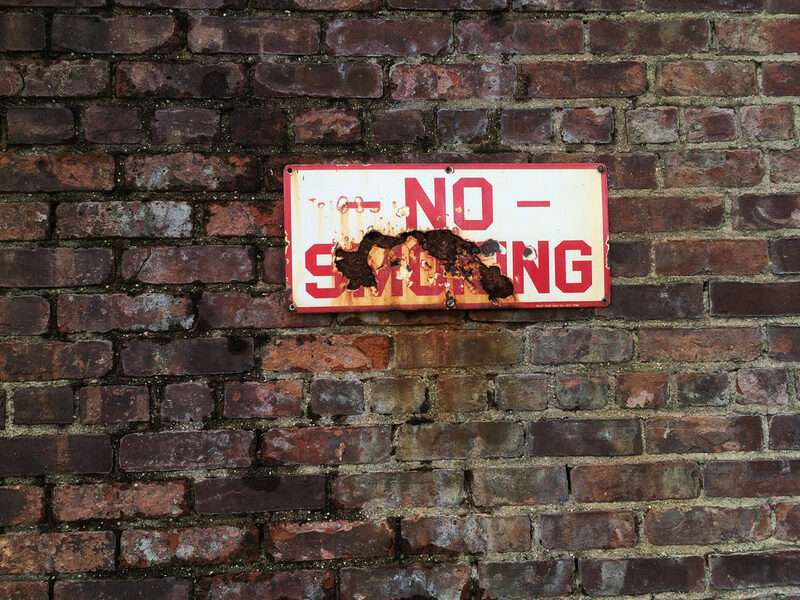 Just three years later, in 2004, the Domino Sugar Factory ceased production, putting 225 workers out of a job and leaving a complicated legacy. 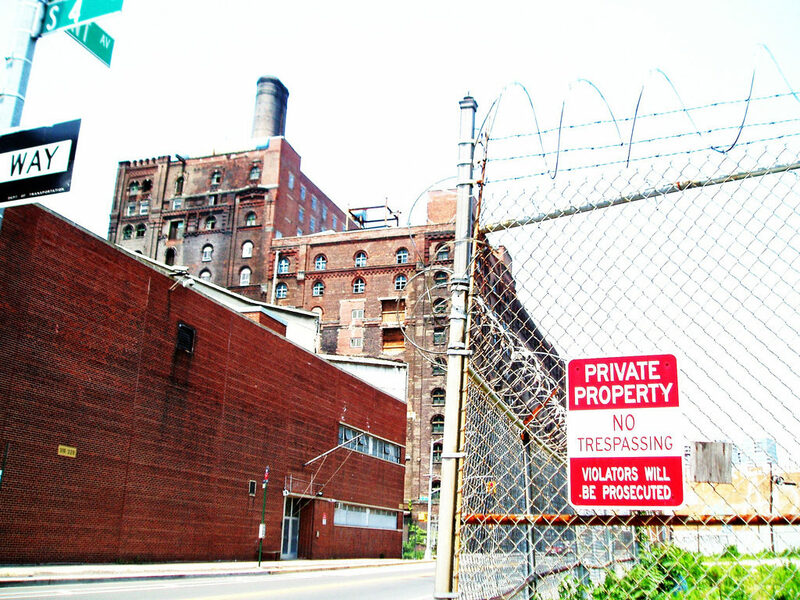 Several efforts were made to redevelop the area in the ensuing years, but none of them stuck until Two Tree bought the old factory in 2012. Working with James Corner Field Operations, who previously designed the High Line — the park on Manhattan’s west side built on an old New York Central Railroad spur — Two Tree put together a proposal to turn the site into a mixed-use development, including a park, work and office spaces, and affordable housing. One housing towers opened in 2017, with construction having begun on a second in 2018; Domino Park opened in June of 2018; and the rest of the project is well under way. 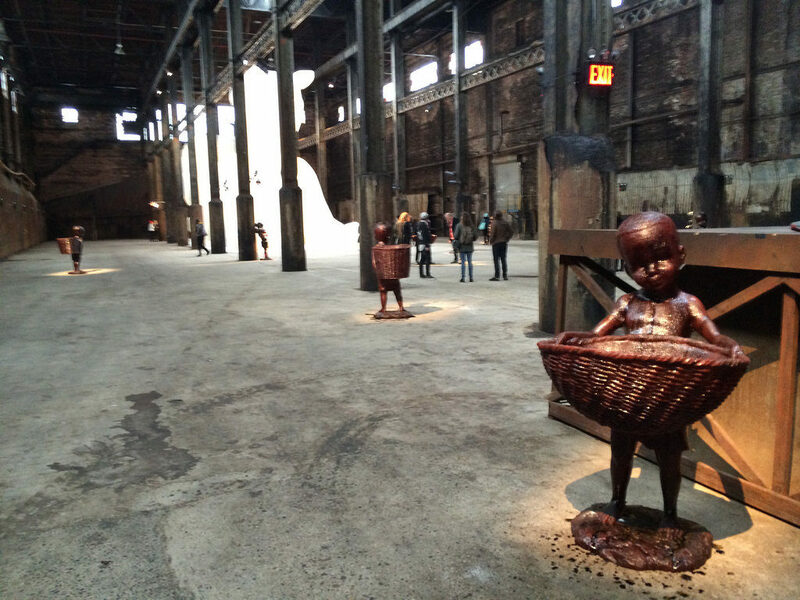 One of the final things to occur at the factory before its redevelopment began was the display of an art installation by artist Kara Walker. 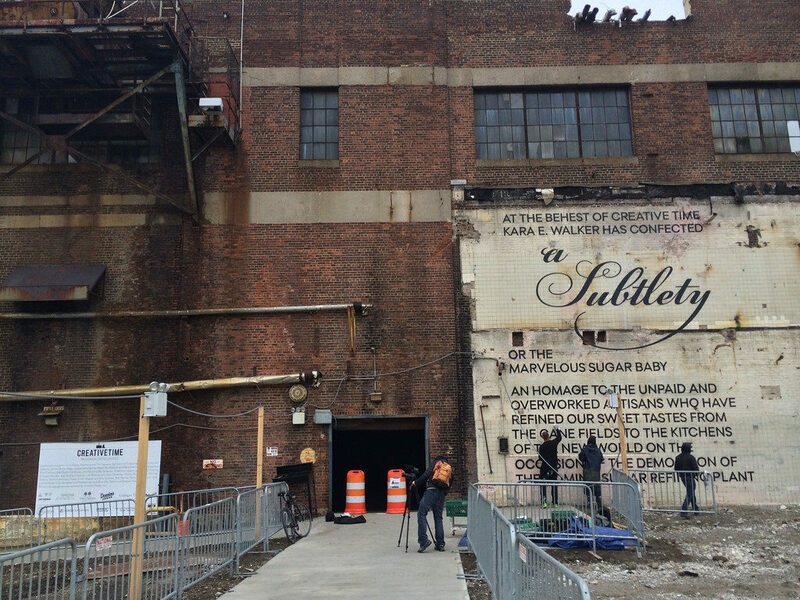 Titled A Subtlety, or the Marvelous Sugar Baby, an Homage to the unpaid and overworked Artisans who have refined our Sweet tastes from the cane fields to the Kitchens of the New World on the Occasion of the demolition of the Domino Sugar Refining Plant, it was commissioned by New York non-profit Creative Time. 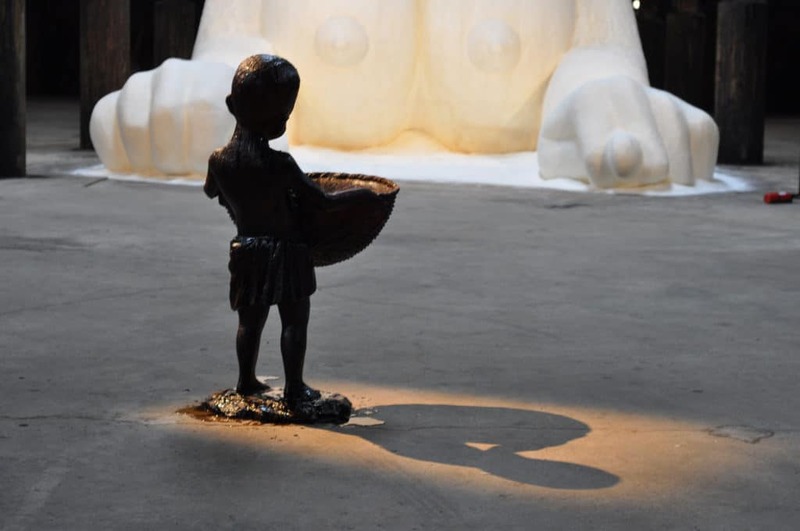 As Hrag Vartanian noted at Hyperallergic shortly before the installation’s opening, the piece didn’t “explore any of the [Domino Sugar Factory] site’s recent past, focusing instead on the shadowy history of the sugar industry in the Americas and its reliance on slave labor for centuries.” Figures of children sculpted from sugar, resin, and molasses carrying baskets filled the edges of space while a huge sphinx reminiscent of the racist “mammy” stereotype made of polystyrene and white sugar dominated the center. 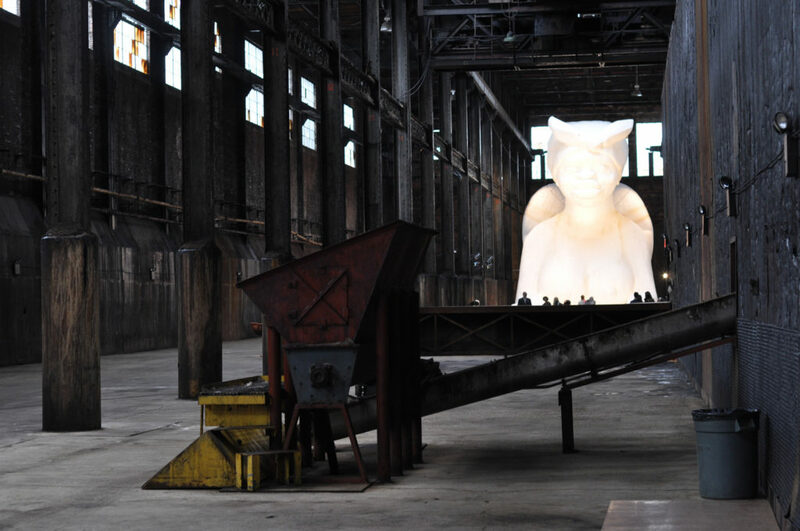 The installation was open to view between May 10 and July 6, 2014; then, shortly after it closed, demolition of the factory began. 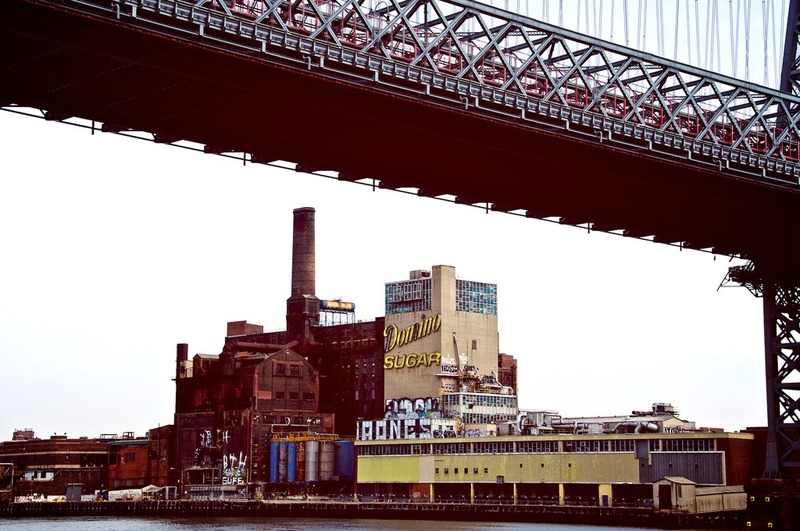 Williamsburg will never be the same — for good; for ill; or perhaps a mixture of both.